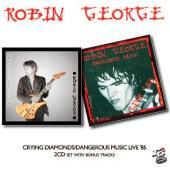 ROBIN GEORGE – guitarist, producer, band leader and vocalist. In his various guises he has worked with the likes of ROBERT PLANT, DAVID BYRON, PHILIP LYNOTT/THIN LIZZY – and WITCHFINDER GENERAL! Rock and pop are mixed in his rather soft output. Celebrity and fame have eluded him in spite of many years in the business. I am rather schizophrenic about him myself. Robin has a fantastic guitar sound, a fine and easily digested voice – but also a penchant for pop. “Crying Diamonds” opens with “Learn the Dance”, which was co-written with DAVID BYRON. The album breathes gentle classic rock, not least in the contagious “Face to Face”, a song that BON JOVI would have squeezed a lot of $ from. To me, a typical ROBIN GEORGE song is like “Flying”. It´s well arranged, has a good refrain, neat guitar work, a fine chorus, but it is also a bit thin of muscle and soft. The title track off LIFE`S “Cocoon” also gets an overhaul, with a result that reminds me of THE BEATLES. “Haunted” was co-written with Daniel Boone (alias PETER GREEN), and GLENN HUGHES has covered it. You can tell that Robin´s influences range from PETER GREEN, JOHNNY WINTER, ERIC CLAPTON etc. Most of the songs have a ring of earlier decades. Robin´s era with PHIL LYNOTT is hailed with the title track (which was co-written with Phil) and Phil´s ELVIS tribute “King´s Call”. They are not ordinary rocker´s but a title track inspired by THE BEATLES and an emotional ballad. These two types of songs suit Robin best, the rock part is best represented by the solo of the title track, and mostly there. Another typical Robin track is the bluesy “Yesterday´s News”. The mix of soft rock, blues and an excellent arrangement is easily recognized. There are four bonus tracks; “Chance of a Lifetime” was co-written with ex. URIAH HEEP man Pete Goalby and oozes of the eighties. “Machine” and “Red for Danger” are quite straightforward pop, but were covered by ROBERT PLANT. Live in 85´ was Robin with a totally different band; guitarist Huey Lucas, who later on played with Adrian Smith in UNTOUCHABLES, bassist John Camp (RENAISSANCE), keyboard player Alan Nelson (who played with the Troy brothers in STRATUS), and drummer Kex Gorin (ex. MAGNUM). It is decisively more rocking with the opening pair of “Showdown” and “Shoot on Sight”. But “Spy” was a sign of things to come as it is disguised pop. The eighties at its best is displayed in “In the Night”, complete with a keyboard frame. There are quite a few similarities with MAGNUM actually, but without copying, as the guitars are strictly THIN LIZZY. “History” follows the pattern; the opening sequence was probably brought in by Kex as it has a very distinct MAGNUM touch. Towards the end the hits pile up; “Hitlist”, “Heartline”, “Dangerous Music” and “Go Down Fighting”. I would have been in a good mood that night too! Four bonus tracks here also, recorded either at Tommy Vance´s Friday Rock Show or by the BBC at the Paris Theatre. They might not feel as personal and sweaty as the fist twelve tracks, but the sound quality is better. All in all Robin´s guitar is ubiquitous. He sings softly and has gone softer/into pop more and more over the years. I am almost totally convinced that this will become my personal favourit style as the years go by.